Check Delta's baggage allowance and fees before you travel. You don't have to worry about the Delta baggage allowance if you ship your luggage to your destination with Send My Bag. You can choose to send as much luggage as you like at low cost. This way your journey becomes much more enjoyable, without any luggage to think about. Delta’s carry-on allowance permits passengers to bring on board one cabin bag, plus one personal item, free of charge. Bags must not exceed 22 x 14 x 9 inches (56 x 35 x 23 cm). There is no weight restriction on the majority of routes. Certain additional items are exempt from Delta's carry-on baggage allowance and may also be brought into the cabin, such as an umbrella, a seat restraint or a pushchair. On Delta Connection flights with 50 seats or less, passengers may only bring personal items on board as carry on, due to restricted storage space. Other carry on bags can be checked in at the gate, free of charge. Small musical instruments can be brought on board as part of your carry-on allowance, provided they fit under the seat in front or in the overhead locker. Larger items that are too fragile to check can be placed in their own seat, which the passenger must pay for. These items must not exceed 165 lbs (75 kgs). Dogs, cats and household birds (birds are only allowed on domestic US flights) can be carried on board for $125 one way to/ from most destinations within the US/ US Virgin Islands/ Canada or Puerto Rico. The fee is $200 for travel outside the US, and $75 for travel to/ from Brazil. The pet must fit comfortably within a carrier that, in turn, fits under the seat in front. The carrier counts as one piece of Delta carry on luggage. Passengers in the main cabin may check bags weighing max 50 lbs (23 kg) and measuring 62 inches (157cm) in total dimensions. For travel within the US and Canada, the fee is $30 for the first bag and $40 for the second bag. For travel between the US/ Canada to / from Europe/ North Africa, Basic Economy passengers must pay $60 for the first checked bag and $100 for the second checked bag. The first checked bag is typically free for standard Economy passengers. The number and size of checked bags permitted by Delta’s baggage allowance vary according to route travelled and the passenger’s fare type. 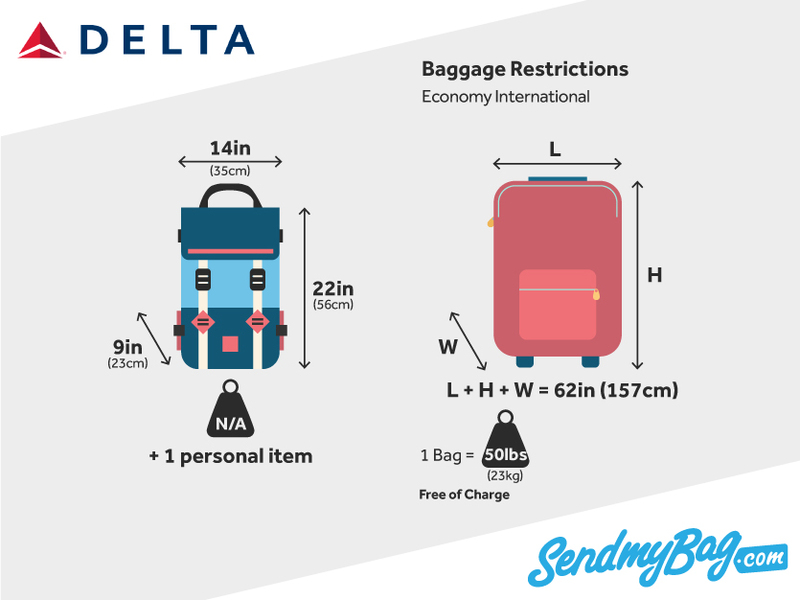 If a bag exceeds the size/ weight or quantity of bags permitted by Delta’s baggage allowance, excess fees will be charged. Fees apply to each limitation. This means that if an extra piece of baggage exceeds the weight and size limits, the passenger will have to pay three fees: one for the extra bag, one for going over the weight limit and one for exceeding the size restriction. The fees charged, once again, vary according to the route travelled. For extra bags checked onto a flight within the US (incl. the US Virgin Islands and Puerto Rico), the fee is $150, one way, for the first extra bag (the 3rd bag in total), or $200 for each additional bag after that. For travel between North/South/Central America and Europe or North Africa, the charge is $285 each for bags number 3 – 10. Passengers are permitted to check up to a maximum of 10 bags on flights operated by Delta and up to 4 on Delta Connection flights. According to Delta’s checked baggage allowance rules, overweight bags incur fees that differ depending on the route travelled. For flights within the US/ Canada, the fee is $100 for bags weighing between 51-70 lbs or $200 for bags between 71-100 lbs. Bags over 100lbs (45kg) are not allowed. For flights between the US and Europe, the fee is $100 for bags weighing between 51-70 lbs. Bags over 70 lbs are not permitted. Oversized bags also incur different costs depending on the route travelled. For travel within the US/ Canada, the charge is $200 for a bag between 63-80 inches (161-203 cm) in total dimensions. For travel between the US and Europe, the fee is $300 for bags with total dimensions between 63-80 inches (161-203 cm). Bags larger than 80 inches (203cm) are not allowed in the hold. Exceptional items like sports equipment can be viewed as standard hold luggage if they are small enough. One golf bag can be accepted as a normal item of checked luggage. Fees apply to some items. For example, it costs $150 to check a bike into the hold. Musical instruments may be checked into the hold, providing they don’t exceed 150in (381cm) in total dimensions or 165lbs (75kg) in weight. Looking for Delta sized hand luggage?